The North’s relationship with the South of Ireland has always been a tricky one. 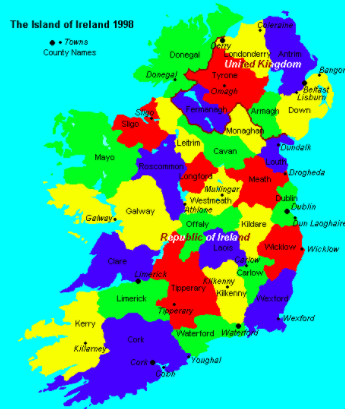 For decades the southern part of Ireland was ignored by the six-counties state – they were a priest-ridden, bog-poor lot who censored their own writers and enjoyed listening to diddly-dee music and old men with no teeth singing tuneless dirges. Then in the early 1960s, the Prime Minister in the North, Captain Terence O’Neill struck up a relationship with Sean Lemass, the Taoiseach of the time. O’Neill took the view that it’d be better to have Catholics/nationalists inside the tent rather than outside, so he met with Lemass and started doing a tour of convents, getting his photograph taken with amenable nuns. Ian Paisley moved swiftly to snuff out this sign of unionist softness, O’Neill’s famous “Ulster (sic) at the crossroads” speech followed shortly after, and the rest is history. When he talked, O’Neill sounded as though he had a ball of cottonwool lodged up each nostril. But he was a man ahead of his time. He knew that if it was ever to be secure, the state he led would have to find a way of turning marooned nationalists into soft unionists. The fact that it didn’t work wasn’t surprising: few of the unionist population needed Paisley to tell them that Catholics were the enemy within. Ever since, unionists have felt imperilled. The Sunningdale Agreement of 1973 perished as a Workers’ Strike was called and paralysed the state. The Anglo-Irish Agreement of 1985, which gave Dublin a consultative role in northern affairs, led to the massive Ulster Says No campaign. Paisley made his famous “Never, never, never, never!” speech and British Secretaries of State like James Prior felt the brunt of unionist rage. Dublin must be kept out of northern affairs. Then somehow we stumbled to the Good Friday Agreement, which was never signed up to by the DUP but which was broadly supported by everyone else. Yes, the DUP took their places in the Assembly and the Executive, but it was reluctantly. The men of blood with whom they saw themselves governing weren’t the only problem. There was the fact that Dublin again had a role – however minor – in northern affairs. Few could fault the south of Ireland for their stance. For decades, they’ve leant over backwards to criticise republicans and empathise with unionists. The DUP, as is their wont, received this support as mere normalcy: what would the south or anyone else do but support loyal subjects of Her Majesty? All that was pre-Brexit; now Brexit has come and is changing everything. The continued existence of the United Kingdom is in question, not just the links with the north of Ireland. I said Brexit ‘changed everything.’ Tell a lie. It hasn’t changed unionist politicians. Robin Swann has told Simon Coveney, the south’s Foreign Minister, to “step away from the microphone” for daring to say that the Good Friday had a clause that allowed the Intergovernmental Conferences to make decisions about the north , in the absence of an Executive. Gregory Campbell has said there needs to be some straight talking with Simon Coveney and others in the southern government. This interference of his will not be tolerated. There are two facts I think unionist politicians need to take in and accept. The first is that the southern government only ever gets involved in northern politics when it thinks there are votes to be gained in the south by such involvement. The second is that Ireland’s history and geography make it impossible for the north to ignore the south and vice versa. Why do you suppose a majority here voted to Remain in Europe? Because they saw how interwoven cross-border trade and commerce are. In addition, as Sinn Féin grows in the south and Fianna Fail tries to nerve itself to stand in the north, as the unionist population grows older and the nationalist population swells, as the absurdity of an economic border becomes clearer and clearer, the unionist population is beginning to see that simply shouting at nationalism and the Dublin government makes as much sense as King Canute shaking his fist at the tide. They would do well to strike a bargain with nationalism and the south before it’s too late.